While the days of giant creatures roaming the earth are gone, we tell stories of their greatness in movies, books and even in school. The only reason we even know about them is because we have had archeological finds that show us their bones and anatomy. Ever since their discovery, we have had this fascination with these large reptiles. 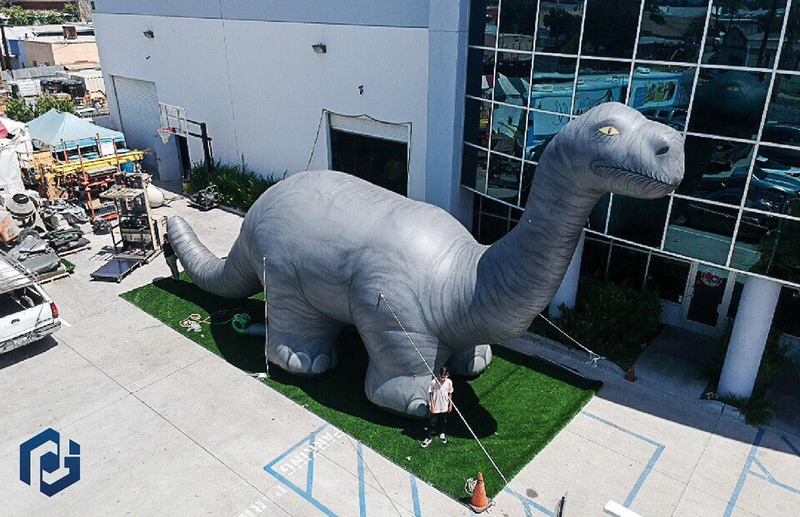 Naturally, since we create inflatables, it was only a matter of time until we created inflatable dinosaurs. The large inflatables are perfect for decorating exhibitions at museums, special events, galleries, schools, or even movie theaters! Attract the attention of anyone in the area with one of these realistic inflatables from afar. Their large size is nearly impossible to miss and since they aren't a common sight, they will definitely draw in a crowd. With a total of 7 dinosaur varieties at the moment, we are in the process of developing more to round out our selection. Our most popular one is by far the T-rex because of the icon it has become in general. We also have a dragon, which we know is not a dinosaur, but it is also a popular item and it was most related to the dinosaur category, so we placed it in there because it's a fantastical fire-breathing dinosaur/reptile One of the key factors to consider is also the fact that there are multiple sizes of the same inflatables. They are all available in a 10', 15', 20', 25', 30' and 40' sizes. This gives you the option to have the right size for your event! The T-rex is, as mentioned before, our most popular dinosaur inflatable because it is so popular as a dinosaur in general. When people think of dinosaurs they immediately gravitate to the more aggressive and scary T-rex. It is constantly debated wether their tiny arms were effective or not. It gets a lot of air time in movies and it is a magnet for action scenes because of its crazy array of giant teeth. When people see one, they recognize it immediately. It is an unmistakeable dinosaur that would instantly attract a crowd because of how iconic it is. Imagine seeing one on a rooftop for an exhibition! Or imagine it holding a "sale" sign. How about in the middle of a parking lot? Regardless of where you put it, it will look great. People love the t-rex inflatable and they even take pictures with it because the opportunity is too good to pass up. You can rent one for your next event or you can buy one and use it for every one of your special events! The triceratops is another extremely popular inflatable dinosaur. Perhaps not as popular as the t-rex, but it is up there. It's unique shape is something to take into consideration when you think about it as an inflatable because, unlike the t-rex, it has a horizontally long body. The t-rex can be very tall as it was more of a vertical creature but the triceratops is a quadruped so if you need it to be tall, just remember it will also be long. For example, the t-rex can be 30 feet tall, and it will be around 15-20 feet long. On the other hand, if a triceratops is 20 feet tall, it will be 54 feet long due to the ratio of the dinosaurs body. It is perfect for dinosaur themed parties or events. 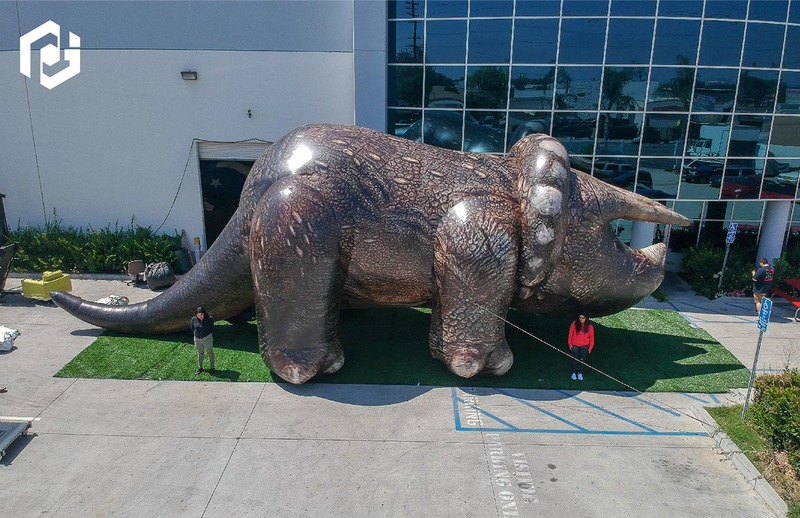 Our Stegosaurus is another one of our beautiful inflatable dinosaurs. It has a somewhat offset body ratio that we wanted to be able to capture for those who saw it. All of the dinosaurs we create are made as realistic as possible to stay true to the creature's skin tones, features and body ratios. Among all of the dinosaurs it is known most for having a walnut sized brain, although it is not actually true. It had a brain the size of a medium sized dog but when you take it into account with its brain to body ratio, the brain is quite small. It was one of the few dinosaurs that had back plates so we wanted to make sure we could depict it properly for the body to be as realistic as possible. Another key feature was the set of tail spikes that it used to protect itself from predators. We added multiple of the tail spikes to the body with a proportionate size so it too was as realistic as possible. The overall result is an incredibly good looking dinosaur replica! The brontosaurus is another incredibly iconic dinosaur due to it's uniquely long neck. The brontosaurus is often debated to be an apatosaurus because of the bone wars between Marsh and Cope. Regardless it is a sauropod which featured a long neck and tail with a centralized body formation. It had four stubby legs that supported the weight for the dinosaur's heavy body (roughly 15 to 25 tons). It is one of the dinosaurs that captures everyone's imagination because of its incredible size. The inflatables we create are definitely not that heavy but they are quite big. They are air filled with a continuous air blower that keeps it firm. It is the use of air that keeps the inflatables easy to use while allowing them to be such incredible sizes. The brachiosaurus is another similar dinosaur that is quite large and which is also part of the sauropod family. It is one of the largest Sauropods with a size of 85 to nearly 100 feet in length. It features a longer neck and tail than the brontosaurus which maxed out at 75 feet in length. Our Brachiosaurus is 35 foot tall, although we do have some shorter versions for those who cannot accommodate the large inflatable size. It features a unique pattern and it has a different shape than the brontosaurus. If you think of a "long neck" then this is probably what you have in mind. While we have not discovered fossils of what we can call a dragon we do have fossils of dinosaurs. Perhaps the dragon was just a myth. Regardless, it is a mythical creature that resembles a dinosaur, quite a lot. It would be quite scary to have something look quite similar to a hybrid between a pterosaur and a tyrannosaurus that just so happens to spit fire. Good thing it's only a myth! Anyway, we know it is a popular creature and we have created one for those who might need one. It is 30 feet tall but we do offer multiple sizes in between a 10 foot and a 40 foot size.